St. Andrew's Holborn church entry for Robert's baptism. See footnote #1 for an explanation. 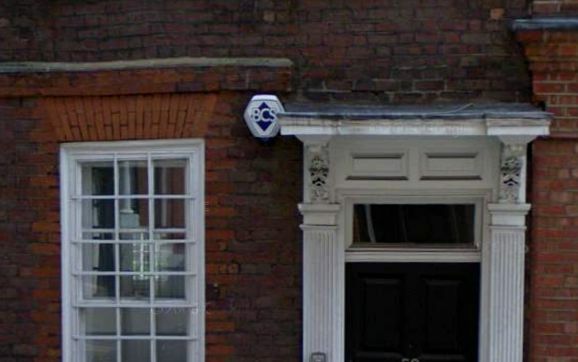 Robert was probably born on Caroline Court, in London's Holborn neighborhood next to the parish border with Clerkenwell. His parents were living there when he and his older brother James were baptized at St. Andrew's Holborn. 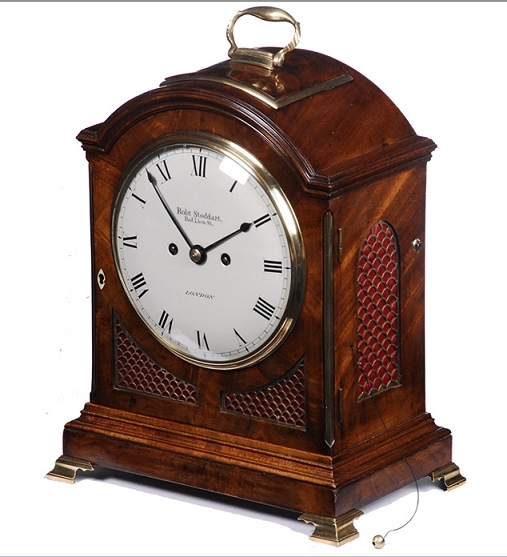 (1) When he was 15, Robert was sent to Edinburgh to apprentice with Alexander Dickie in Edinburgh to learn clock and watch-making. (2) Dickie's shop produced very fine pieces. Former Clock & Watchmakers and Their Work says that "John Melville and ---- Stoddart" were partners between 1804 and 1810 at 61 Red Lion Street. Robert Stoddart is listed as being there between 1814 and 1842. This is a conflation of father and son. The 1814 Directory of London Professions and Trades says Melvill & Stoddart were at this address. In Jane (Bradford) Gooch's biography of the Stoddarts, she says that Robert apprenticed with James Melvill of 61 Red Lion Street and was later his partner. This was likely based on oral history passed down to her. Melvill was undoubtedly Robert's brother-in-law John, who married Janet Stoddart. Who was in the Red Lion Street house first hasn't been found. In 1811 Robert insured that property and is listed there as a wholesale watchmaker in the London Directory of Professions and Trades for that year. Information passed down in the family says the Stoddarts lived there as well, and this is confirmed by testimony given by Robert in 1817. () All this indicates the Stoddarts owned or were sole lessees of the property. Robert and another watchmaker, William Webb, had a co-interest in insuring a property at 19 Wilderness Row, St. John Street in 1811. These men were involved with the "Watch and Clock Makers' Benevolent Institution," headquartered in Clerkenwell. Robert was a trustee, William was a secretary, according to an 1815 publication. There is no other indication of a Stoddart/Webb partnership. Robert's burial record at St. James Church says he was a resident of Red Lion Street. His will, made on 1 January 1829, doesn't mention the house, but he left his business concerns to his eldest sons Robert and James, who were also watchmakers. Was the house part of this? Robert, Sr., died in October 1830 and these sons jointly insured the house on their own the following January. To his son John and six daughters, who aren't named, he gave 600 pounds each. The assets were to come from his watchmaking company, and if not paid two months after his death, were to have interest added. If there is a probate file with further papers, it may indicate how and when the bequests were paid. The Stoddart house at 61 Red Lion (now Britton) Street, Clerkenwell, London. vital records sources: See note #1 below for his baptism. His death date is in compiled notes passed down in the Robert Keating Smith and Stanton McMasters Smith families. A burial record in St. James, Clerkenwell, parish gives a date 9 day later. The same parish records have his marriage. 1. St. Andrew's Holborn parish register, ancestry.com online database. The entry for Robert identifies the family by the name Smith rather than Stoddart ("James & Miron Smith Caroline Court"). James, Jr.'s, entry two years earlier says "son of James and Marion Stoddart Caroline Court." Robert's birth year passed down in his family in compiled notes is 1772. When he married in November 1792 he is called a minor, indicating he was born after November 1771. Given this and that Marion's maiden name was Smith, this entry is very likely for Robert Stoddart. 2. 1 March 1787. Book: Volume 5. The Register of Marriages. (Marriage); Collection: Midlothian: Edinburgh - Register of Apprenticies, 1756-1800 REPORTS FROM COMMITTEES: POOR LAWS; CHIMNEY SWEEPERS; STEAM BOATS; etc., 28 Jan to 12 July 1817, vol. 6, p. 17. Testimony about the lack of work for craftsmen in the watchmaking business due to inferior watches smuggled into England counterfieted with known makers marks.